Pat worked as secretary/office manager for Beautiful Savior since January of 1999. Since 1999, Pat has worked with Pastor Prange, Pastor Eckstein, and the current pastor, Pastor Bretscher. 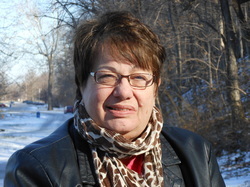 Pat has lived in the St. Louis area all her life and loves the changing seasons of the Midwest. She is married to John, also a native of St. Louis, and have 2 children. Their daughter, Stephanie, is married with 2 children and has just completed her Master's degree at Lindenwood University, in psychology and school counseling. Their son, JP, is attending Mizzou, majoring in strategic communications, journalism, and advertising. When Pat and John are not doing something with their children or grandchildren, they enjoy working on their family home. Pat also enjoys dabbling in art, reading and her newest hobby is photography. John enjoys anything that has to do with old cars, and is quite artistic in metal work. He has a passion for smithing. Pat retired in the summer of 2013 and is keeping busier than ever! Part of her time is spent developing her small business. She and John would eventually like to retire in the Southwest and have a small business. John can make things, and Pat can paint them, take pictures of them, and with God's blessings, can sell enough to help make ends meet! Beautiful Savior is thankful for Pat's dedication and wonderful work during the past years. We wish her God's richest blessings!